Identity theft is a serious crime. It can hurt your credit, leave you stuck with bills that aren’t yours, and create problems that could haunt you for years. give your name and information to police during an arrest. You see unexplained bank withdrawals. You’re not getting expected bills or other mail. A store won’t accept your check, debit card, or credit card. You get calls from debt collectors about unfamiliar debts. There are unexplained accounts or charges on your credit report. You get bills from medical providers for unexplained services. Records show you’ve reached your medical benefit limit even though you believe you haven’t. The IRS tells you that more than one tax return was filed in your name or that you have income from an employer that isn’t yours. A company you’ve done business with or have an account with tells you that there has been a data breach of personal information. Remember: If you lose your wallet, credit card, Social Security card, or passport, you should immediately take steps to protect yourself from identity theft. Identity thieves are smart and will find ways to steal your personal information if you’re not careful. A thief might get your information from bill statements that were thrown in the garbage or by hacking into your bank’s computers. Always be on the lookout for unexplained account activity in your name. Always use strong passwords for your online accounts. Use a combination of letters, numbers, and symbols that will be easy for you to remember but hard for thieves to guess. Don’t carry passwords or PIN codes with you. Many identity crimes involve a lost or stolen wallet or purse. Don’t make it easy for thieves to use your cards. Never carry your Social Security card with you. Leave it at home. 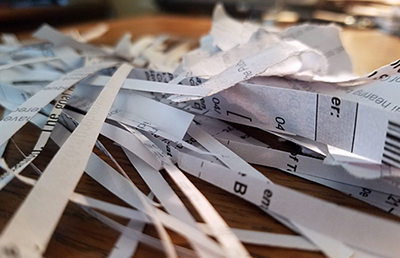 Shred or tear up documents containing your personal information before you throw them away. Don’t make it easy for thieves to go through your garbage and steal your information. Never give out your personal information (Social Security number, credit card number, bank account number) over the phone, in the mail, or over the internet unless you’re giving it to a company you know and trust. Don’t let mail sit in your mailbox! And send your mail from an official U.S. mailbox – it’s safer than leaving it in your home mailbox. 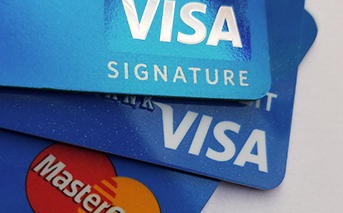 Opt out of offers for new credit cards. Call 1-888-567-8688 or visit www.optoutprescreen.com to avoid offers for new cards, mortgages, and other loans. 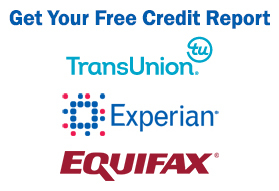 You are entitled to get a free annual credit report (www.annualcreditreport.com) from each of the three credit reporting agencies every year. You can stagger your requests from the different companies throughout the year instead of getting them all at once. This way you can regularly check your credit for unfamiliar charges without paying for a credit report. Important: Report lost or stolen credit and debit cards right away. Under most state laws, you’re not responsible for any debt from new accounts opened in your name without your permission. Under federal law, the amount you have to pay for unauthorized use of your credit card is limited to $50. If you report the loss to the credit card company before the thief uses your card, you aren’t responsible for any charges. If your debit or credit card is lost or stolen, you can protect yourself by reporting the loss immediately to your bank, credit union, or credit card company. If you report your card lost before any charges are made, you won’t be responsible for any charges. If you report your card lost within 2 business days after you learn about the loss or theft, you can only be responsible for up to $50 in charges. If you report your card lost more than 2 business days after you learn about the loss or theft, but less than 60 calendar days after your statement is sent to you, the most you can be responsible for is $500. If you report your card lost more than 60 calendar days after statement is sent to you, the amount you owe could be unlimited. If your credit or debit card was lost or stolen, immediately contact your bank or the credit card company and report the cards lost or stolen. They should be able to tell you the last few times the card was used. If you don’t recognize any of the recent transactions, ask your bank to reverse those charges so you don’t have to pay them. If they won’t reverse the charges, see Step 3. If your passport was lost or stolen or you think someone ordered one in your name, call the U.S. Department of State at 1-877-487-2778. If you think someone stole your identity, it’s important to keep records of everything you do to correct the problem. Keep a record of the phone calls you make. Write down who you spoke with, when you spoke, and what you talked about. Keep copies of any letters or emails that you send or receive. Keep track of the time and money you spent trying to fix the problem. In some states, an identity thief can be made to pay the victim back for the time and money the victim lost because of the crime. 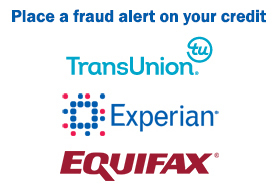 Placing a fraud alert on your credit reports will reduce the risk that someone can open new accounts in your name. The fraud alert will stay on your credit file for 90 days, and you can renew it if you need to. A fraud alert won’t stop someone using an existing card or account, but it will make it difficult for someone to get new credit in your name. When you place a fraud alert with one of these agencies, they must contact the other two agencies and tell them about the fraud alert. 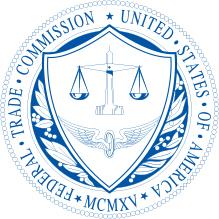 The Federal Trade Commission (FTC) handles identity theft claims. If you believe someone stole your identity, call 1-877-438-4338 or go to identitytheft.gov and report what happened. You can also call them if you have any questions or concerns. They will tell you what your rights are and how you can protect yourself. You won’t submit this form to the FTC, but you can keep it for your records and give it to the police if you file a complaint with them. You can also give it to creditors and to a credit agency if you disagree with something on your credit report. If you have any questions about how to fill out this form, call the FTC at 1-877-438-4338. Once you have filled out the form, make a couple of copies of it. You should alert the police in your city that someone stole your identity. If the identity theft happened because someone stole your wallet or purse, you should also report the crime to the police department in the city where the crime occurred. Ask the police for a copy of your police report and give them a copy of the FTC complaint form that you filled out. If police cannot give you a copy of their report, ask them to sign your FTC complaint form and write the police report number in the Law Enforcement Report section. It may be helpful to bring a copy of the FTC’s Memo to Law Enforcement with you. A police report along with the FTC complaint form will give you stronger protection than just the FTC complaint form alone. These two documents together make up your identity theft report. When you place a fraud alert with a credit reporting agency, you are entitled to a free credit report from that agency because you placed the alert. They should send you a letter that confirms your fraud alert and tells you how to get a free credit report. You are also entitled to one free annual credit report per year from each of the three credit reporting agencies. This free report is different from the free credit report you were entitled to when you placed the fraud alert. You can get your free annual credit report by visiting www.annualcreditreport.com. send you a letter that confirms that the account is closed and that you aren’t responsible for it. Here is a sample letter to help you write to the company: https://www.identitytheft.gov/Sample-Letters/identity-theft-dispute-new-account. Include with your letter a copy of your identity theft report (the FTC complaint form and police report from Step 3 and Step 4). If you see unfamiliar charges on your account, send a copy of your identity theft report to each of the three agencies listed in Step 2 and tell them which transactions on your report aren’t yours. If they continue trying to collect from you, call the FTC for further help. If you believe your Social Security number was stolen or is being misused, contact the Social Security Administration at 1-800-269-0271 and the IRS at 1-800-829-0433. Someone could use your Social Security number to get a job in your name or steal your tax refund, so call both agencies right away. If you believe an identity thief may have used the mail to steal your identity or abuse your personal information (for example, you think someone submitted a change-of-address form to the post office in your name), file a report with the U.S. Postal Inspection Service at http://ehome.uspis.gov/mailtheft/idtheft.aspx. Change all of your account passwords. Make sure you don’t use any personal information, such as your Social Security number or date of birth, as a password. If you think someone may be using your driver’s license, contact your local DMV to get a new driver’s license and driver’s license number. Call your phone and utility companies to alert them that you have been the victim of identity theft. Ask them to be on the lookout for any unusual account activity. Check your computer for viruses. Computer hackers can use viruses to get at your personal information on your computer. Never open email attachments from people you don’t know, and make sure you do regular checks for viruses and spyware.